Text in English and Japanese. 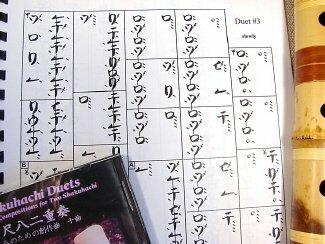 Music scores in Kinko-ryu and Western notation. 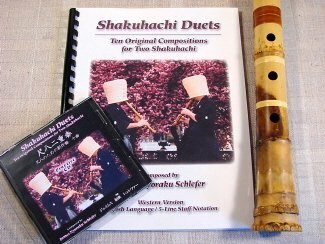 Shakuhachi Duets, composed by grand master James Nyoraku Schlefer, offers ten original compositions for two shakuhachi. This is a dual-language edition with text in English and in Japanese, and the musical scores are transcribed in both Kinko-ryu and Western notation. The accompanying practice CD includes each piece with both parts performed together as well as each part separately. This enables you to play along while following the written notation provided. 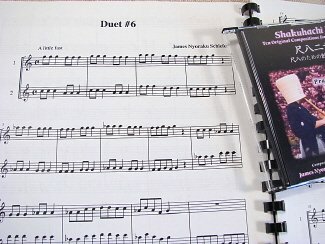 Since the duets are transcribed in Western 5-line staff as well as Japanese cursive notation, they can be played along with silver flute, violin, guitar or any other instrument. Shakuhachi Duets are a great way to learn ensemble playing, valuable experience before playing Sankyoku. The ten compositions start off simply and become progressively more complex, so there is music appropriate for all levels of ability. Each piece is original, yet drawn from traditional shakuhachi melodies and phrasing, challenging the player to exercise commonly used patterns. The tracks on the practice CD allow the player to emulate the traditional Japanese way of learning shakuhachi by copying one’s teacher and playing in unison. This is a unique and fun way to learn ensemble performance.